Brand new Paul Picot is a classic watch Firshire Megarotor Big Date, collected based on the automatic caliber with a 42-hour power reserve. The novelty round case diameter of 42 mm 316L stainless steel or 18-carat pink gold. Water Resistant – 50 meters. Dark blue dial, sapphire glass enclosed antiglare, equipped with overhead hour indexes, central arrows Dauphine, a double date aperture at 12 o’clock, and the counter at 6 o’clock. The central part of the dial is decorated with vertical lines. Watch Firshire Megarotor Big Date supplied on a dark blue leather strap with folding clasp. Launch of Firshire Megarotor Big Date is limited – 400 copies. 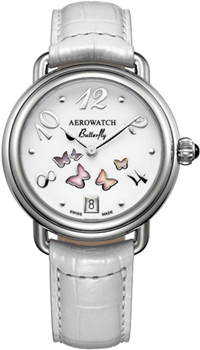 The Swiss watch company Aerowatch is truly a summer novelty – Ladies Watch 1942 Aerowatch Collection Butterfly Ref A 44 960 AA01. 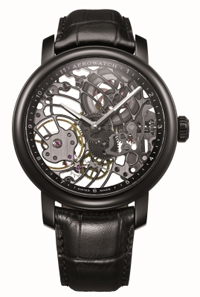 The Swiss company Aerowatch Introduces New Wristwatch Renaissance Black Tornado, which allow you to enjoy every movement in the course of their mechanism, through skeletonized dial and transparent back cover. New made mostly in black and gray shades. Swiss watch brand Aerowatch introduced a new model of Renaissance watches in classic retro style.